Streusel: In medium bowl, mix brown sugar, flour, oats, cinnamon and nutmeg. Cut in butter using pastry blender or fork until mixture is crumbly. Set aside. Batter: In large bowl, stir all pancake ingredients until well blended. Heat nonstick griddle to 350 degrees. or 12-inch skillet over medium-high heat. (To test griddle, sprinkle with a few drops of water. If bubbles jump around, heat is just right.) Brush lightly with vegetable oil or spray with cooking spray before heating to help prevent streusel from sticking to griddle. 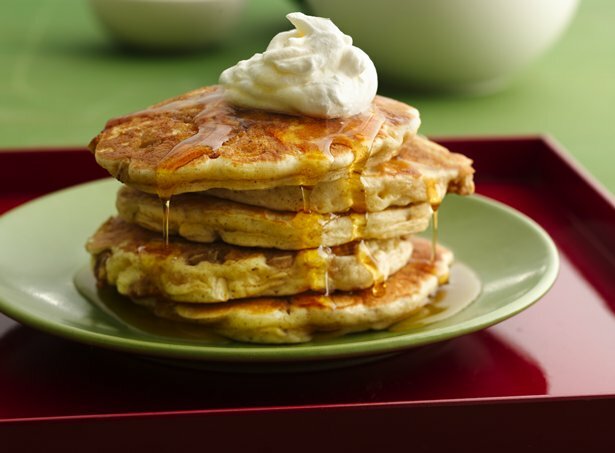 For each pancake, pour 1/4 cupful batter onto hot griddle. Sprinkle each pancake evenly with scant 2 tablespoons Streusel mixture. Cook 2 to 3 minutes or until bubbly on top and dry around edges. Turn; cook other side until light golden brown around edges about 1 minute to 1 minute 30 seconds. Scrape off griddle between batches of pancakes if necessary.